The poor Itty Bitty Brewster has a funky belly button. Now I’m sure you’ll remember that some of the many things I googled in the first few weeks of her life included umbilical cord care and umbilical hernia versus granuloma. I was so concerned about her belly button because her stump fell off super early. Like, at 5 days old early. It was hanging on by a thread and seriously irritating her because it would get caught on her diaper or her onesie or her flailing little hands with every diaper change so we went ahead and nipped that final anchor. When the stump finally came off, the site looked fine enough, though there was a little pink protrudy part in the middle and it would occasionally leave a smear of blood or serous drainage on her clothes. At her two week check-up, Dr. Mike went ahead and cauterized the stump with silver nitrate and said that should take care of the oozing so it could heal up. He also said that she didn’t have an umbilical hernia, but that her belly button would stick out less as her abdomen got bigger and she sort of grew into it. And that was that. Well, the little pink protrudy part didn’t really go away. When Jessie came to visit, I had her look at it and she agreed that it looked a lot like her son’s umbilical hernia and concurred that it would indeed eventually go away on its own, just like Dr. Mike said. Then two weekends ago (right around when IBB was 5 1/2 weeks), I decided that it was not going away at all. In fact, it was getting even more protrudy. So I called that Monday, 11/28, and made an appointment to have one of the pediatricians check it out. And apparently this is not an umbilical hernia or even (like I thought) a super outie outie. This is an umbilical granuloma. (A granuloma is a mass of granulation tissue, typically produced in response to infection, inflammation, or the presence of a foreign substance, in case you didn’t know.) Dr. Hope was a little more aggressive at examining it than I had been and was able to show me that it is indeed a separate little bleb of tissue about the size of a marble with a stalk sort of thing connecting it to her belly button proper. However, knowing what we were dealing with was only half the battle. Actually, more like a third of the battle. As Dr. Hope explained it to me, she was worried we were looking at a fairly rare complication called a patent urachus. The urachus is a canal that exists in utero between the bladder and the belly button. Typically, this closes up after birth. Given Itty Bitty’s granuloma, though, we needed to make sure hers wasn’t still open (i.e. patent) before we took care of the super outie outie, as we could run into all sorts of even bigger issues if we nipped off the granuloma and didn’t address the patent urachus. So off we went to the big hospital last Wednesday for an ultrasound. After much waiting and gnashing of teeth (on my part) and contented napping (on IBB’s part), we got the ultrasound done and got great news – there is no connection between Itty Bitty’s belly button and her bladder. According to what Dr. Hope had told us, this meant that we could just snip off the granuloma at IBB’s next visit, near the end of December. Imagine my surprise when I got a call the next day that our pediatrician wanted to refer us to a pediatric surgeon. The phone nurse was extremely unhelpful, only stating “I don’t know why she won’t take care of it herself, I only know I was told to make you a referral.” Thanks a lot, lady. Our visit with the pediatric surgeon was yesterday. He was very nice, even though he did not take one look and say “Oh this is easy! I can take are of this right now! !” As he explained, granulomas have a blood supply but no nerves and, given the size of IBB’s, he didn’t think it would be a good idea to just go ahead and snip it off due to the potential risk of bleeding and the worry that the suture at the incision site would simply spawn another granuloma. What he did want to do is cauterize it with silver nitrate, much more aggressively than our pediatrician did, and have us come back in a week for a recheck. At that point, if the granuloma has shrunk down, he will continue the silver nitrate treatments until it dries up and falls off. If the granuloma as either stayed the same or grown, he will go ahead with the in-office removal of the outie outie. And given that all doctors must (with good reason) give the worst case scenarios, he explained that if we remove this granuloma and another one pops up, we will be looking at exploratory surgery under general anesthesia to determine if there is indeed a patent urachus that didn’t show up on ultrasound and is causing all of these issues. But he didn’t seem to think that was a likely outcome. We’re supposed to keep the area really dry for 48 hours and then only get it a little wet until follow up. Sadly this puts the kibosh on IBB’s bath time, which is one of her favorite parts of the whole day. Our next appointment is next Wednesday and I’m hopeful that we’ll be able to just have another round of silver nitrate. But we’ll have to wait and see. All this hullabaloo over a teeny tiny belly button. Stay tuned to see how the ordeal of the funky belly button turns out! 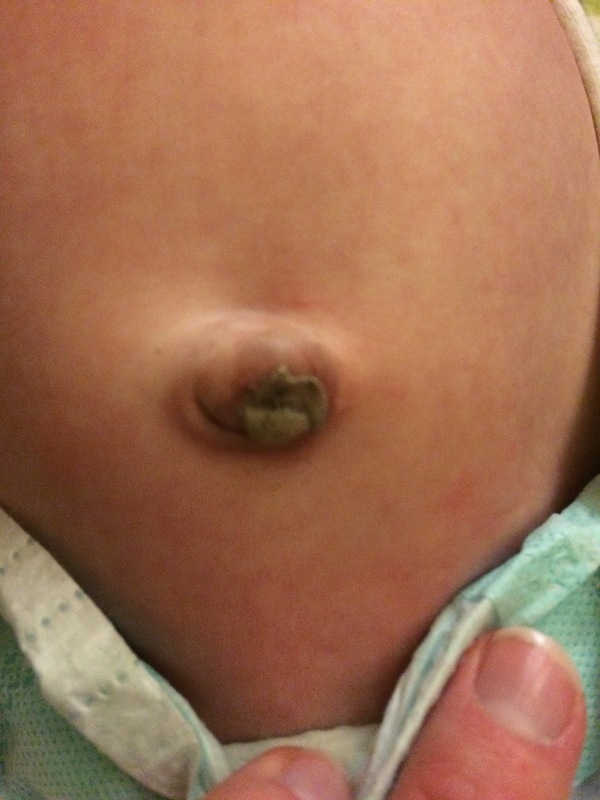 This entry was posted in Babies and tagged Belly Button, IBB, Patent Urachus, Umbilical Granuloma by BrewsterMama. Bookmark the permalink.